I’m wearing my classic Manolo Blahnik pumps that I’ve had since 2007. Only get a classic style. 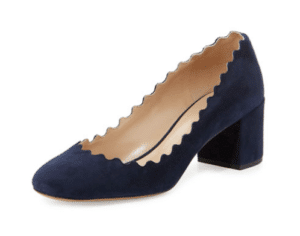 The scalloped edge and round toe on this shoe are trends. Steer clear of trends when buying a classic. While these shoes are pretty and the beading adds visual interest, you don’t want these to be the only black pumps in your closet. The cutouts make these trendy, not classic. 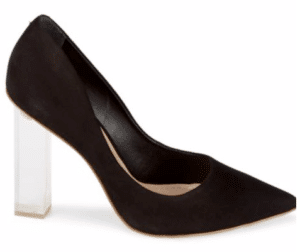 This heel is chunky and lucite, both trendy right now. Therefore, it’s not a classic. Your first foray into any wardrobe classic should start with getting the basics. 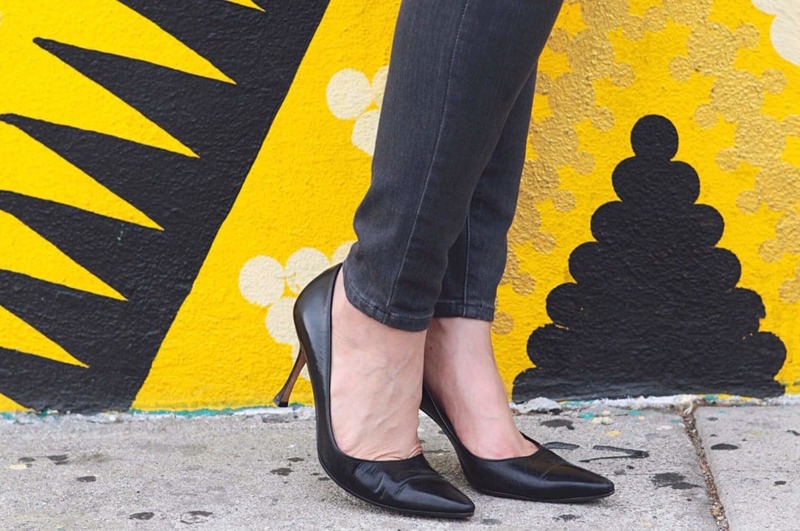 Black pumps are definitely basics and go with everything. However, if you don’t wear black, then choose another neutral like brown or navy blue. I would say to only go for a smooth leather shoe as well, while suede is classic it’s usually not worn during the summer. So you have a great new pair of shoes, but what happens when you break a heel, need them re-soled or need a heel tap replaced? Go to a good cobbler. A cobbler can help you get years out of your shoes, but finding a good one to work on your shoes can be hard. Ask for recommendations from your friends. Here are some high-end options that will rarely go on sale. You will definitely want to use a cobbler to keep them in good shape for years to come. I’m wearing this Manolo Blahnik pump above. 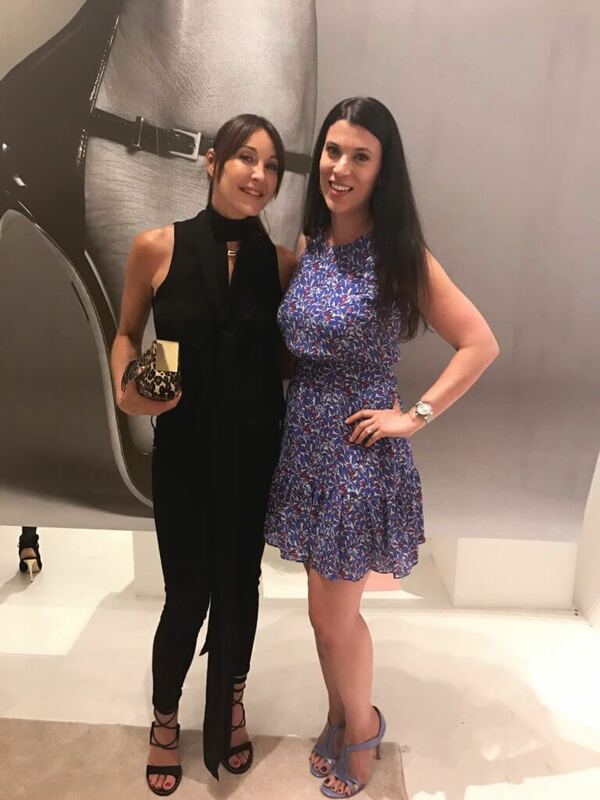 I’m also a fan of Tamara Mellon shoes, she co-founded Jimmy Choo in 1996 and now has her own online shoe store. 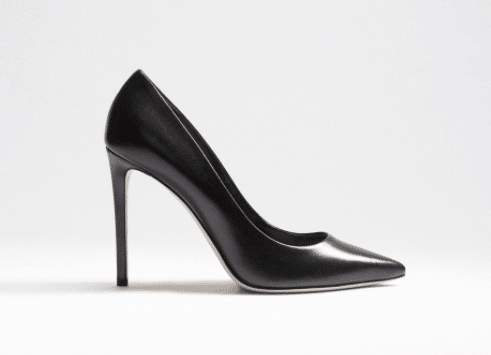 You can only buy her shoes on the Tamara Mellon site , you’ll find the same workmanship as with other high-end brands, but you won’t find the traditional mark-up that comes with having brick-and-mortar stores. 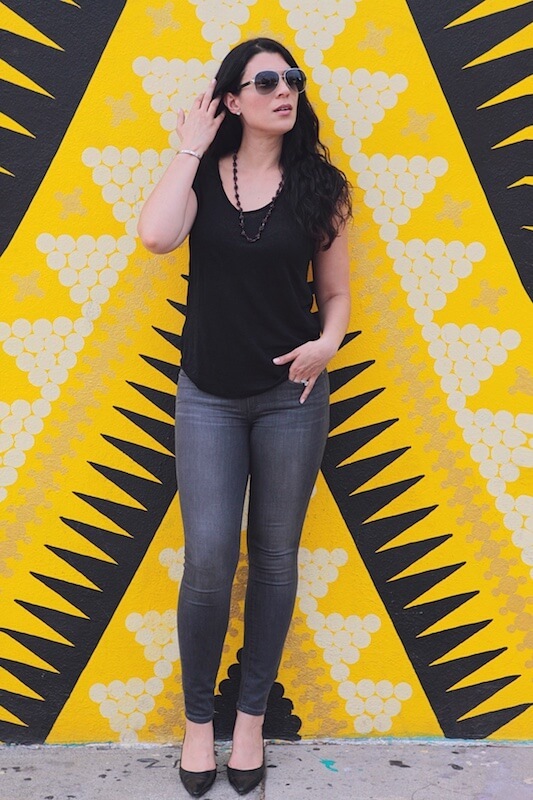 I met her earlier this year to learn more about the brand and I’m a huge fan. So informative! I definitely need to invest in a pair of pumps. Thanks Lora! I hope you find an amazing pair of pumps!